I don’t know if you heard about or had the privilege (I use that term loosely) of watching the Detroit Lions’ first victory at Lambeau field since 1991 this past November, but they nearly blew it with a late, missed extra point. Almost losing in the most Lions way ever came at no surprise to a lifelong fan. However, they pulled it off. Phew. Since the point after a touchdown in American football is only worth one point, it seems to impact the scoreboard minimally relative to the overall score (ultimately, increasing your score by about 14%). Therefore, those extra points are often discounted. But as the Lions displayed, overlooking the extra points can be a grave mistake. That small increase can make or break a team, company, season or even a fiscal year. When a fiscal quarter starts to wind down, sales leaders are scrambling to discover the deals that will get them to their sales goal for the quarter and, most importantly, the year. In reality, those missed extra points throughout the year could lead to a chaotic and stressful close. Did you make enough prospecting calls to build your pipeline? Did you follow up adequately with the prospects that said, “Call me in a month?” Did you set enough qualified meetings? Most importantly, do you have an adequate way to track any of this? Obviously, trying to hit your number is stressful. Incorporating new technology into your sales process at any time may seem like an impossible task. But you might find it can dramatically decrease that stress, by allowing your organization to focus on what matters the most throughout the day, week, month and year. To focus on those extra points. Maybe those extra points for are your KPIs around calls made, meetings booked, opportunities converted, proposals sent or some entirely different leading indicator that leads to more sales wins. Regardless, that extra point is extremely important. Unfortunately, most teams don’t realize it until the game is on the line and your back is against the wall. That’s why it might be worth it for you to consider boosting your sales stack before the end of this quarter with technology that increases sales performance at real companies. 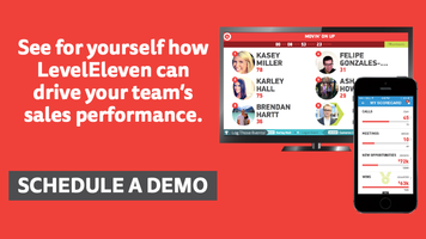 Check out an example of how LevelEleven did this at Corporate Executive Board, increasing activity production by 2.3 activities per rep per day, equaling 1,690 qualified sales meetings in just three weeks. For many modern sales teams, LevelEleven’s sales performance platform helps track the extra points in sale, moving the needle across the board and uncovering revenue that may not have been realized otherwise. As we enter a new fiscal year, sales leaders scramble to discover deals that will get them to the number. Missed extra points lead to a disappointing close.